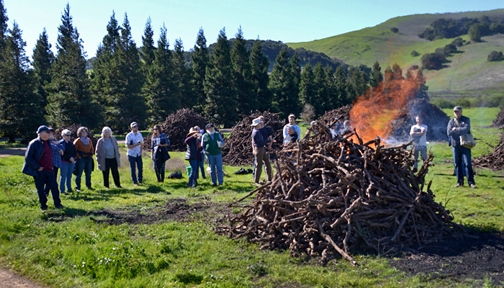 In collaboration with The Vineyard Team and the air quality management districts in San Luis Obispo and Monterey counties, we are happy to announce that we will be giving conservation burn workshops in each county on April 11th and 12th. 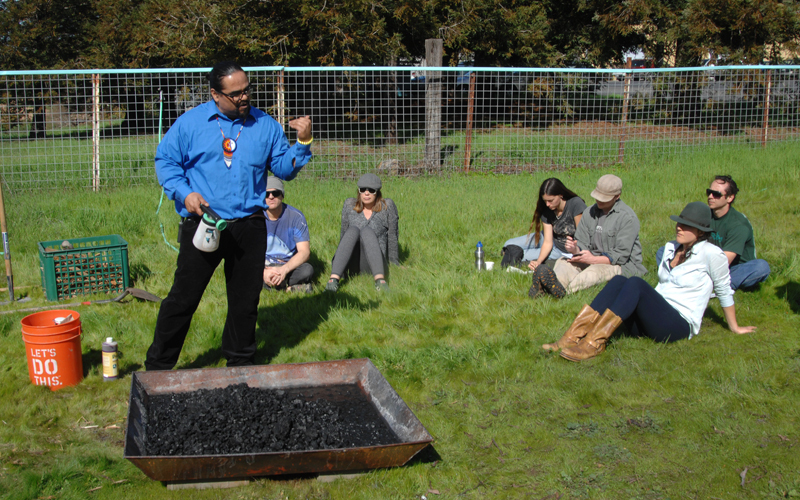 Each workshop will be 4 hours in length and include a lecture on biochar and the theory behind this cleaner burn methodology along with a hands-on field burn. Due to forecasted rain later this week, we have moved the Workshops to these new dates next week. 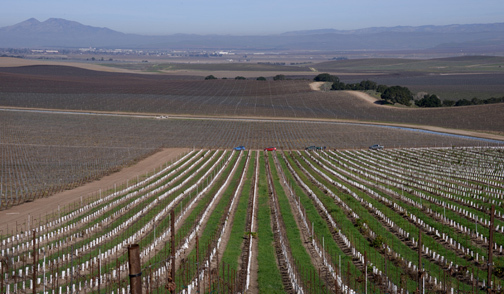 April 11th San Luis Obispo County, J Lohr Vineyards and Wines, Paso Robles 9 A.M. to 1 P.M.
April 12th Monterey County, Ste. 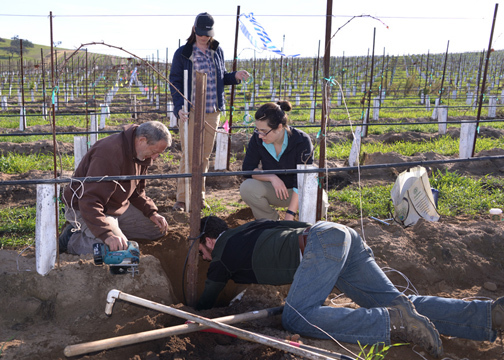 Phillipe Vineyard, Soledad 9 A.M. to 1 P.M.
We have some exciting plans for CBA this year and we need your support to help expand our efforts to scale biochar production and use. Check back soon for more details. Go to www.calbiochar.com and click on the donate button to make a tax deductible contribution. 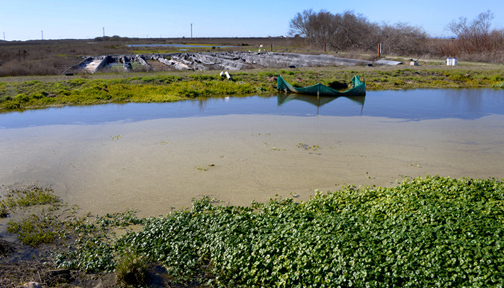 The Sonoma Ecology Center, a 501C3 with a 25-year track record, is our fiscal sponsor. Thank you in advance! 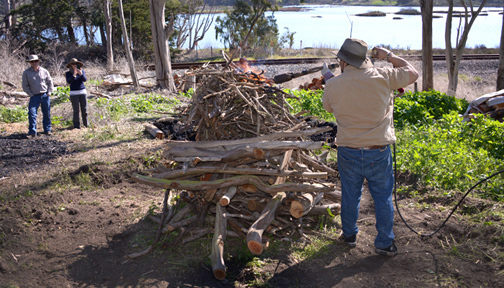 Redwood Forest Foundation North Coast Biochar For Sale!!! 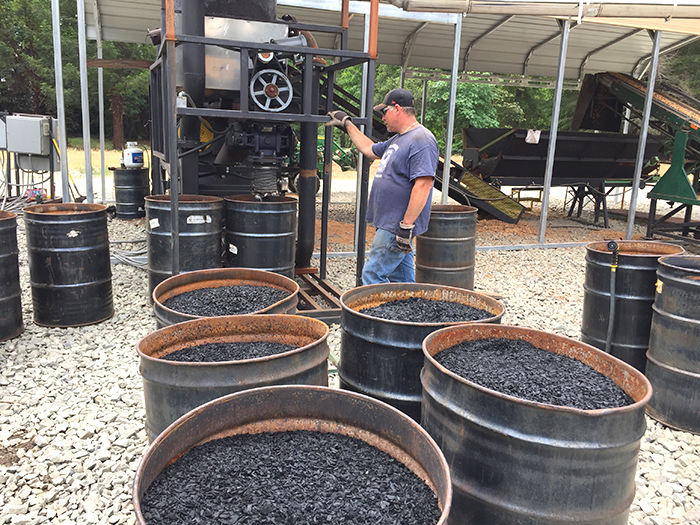 The Redwood Forest Foundation has 72 cubic yards of high carbon, low ash biochar for sale in 1.5 cubic yard totes. 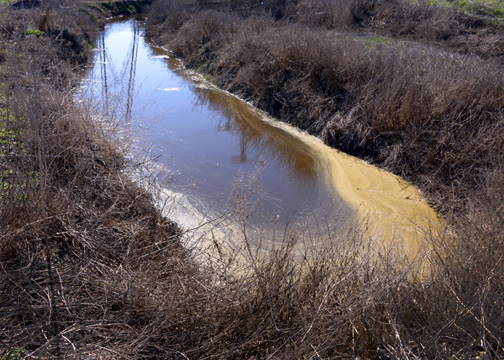 60 cubic yards are being stored in Piercy, in northern Mendocino County just below Garberville, and 12 cubic yards are at a location near Petaluma. The price per cubic yard is $125, or $187.50 for individual totes. Call for larger quantity pricing. Shipping, if requested, is additional. This biochar was produced using a Biochar Solutions pyrolysis machine at 600 degrees C from one feedstock: surplus tanoak coming out of the Usal Forest. Characterization analysis available by request. To purchase, contact raymond@sonomabiocharinitiative.org or call 707 291-3240. Biochar production and use was highlighted in the most recent IPCC climate change report as one of the least expensive and easily scaled methods of drawing down carbon from the atmosphere, and this recognition has helped bring the biochar story to the forefront of many climate change mitigation discussions and actions. There is, however, much research that still needs to be done to better characterize which types of biochar will persist the longest in varying agricultural soils, under what type of farming protocols, as well as creation of a standardized system for rating biochars based on a set of common criteria and characteristics. 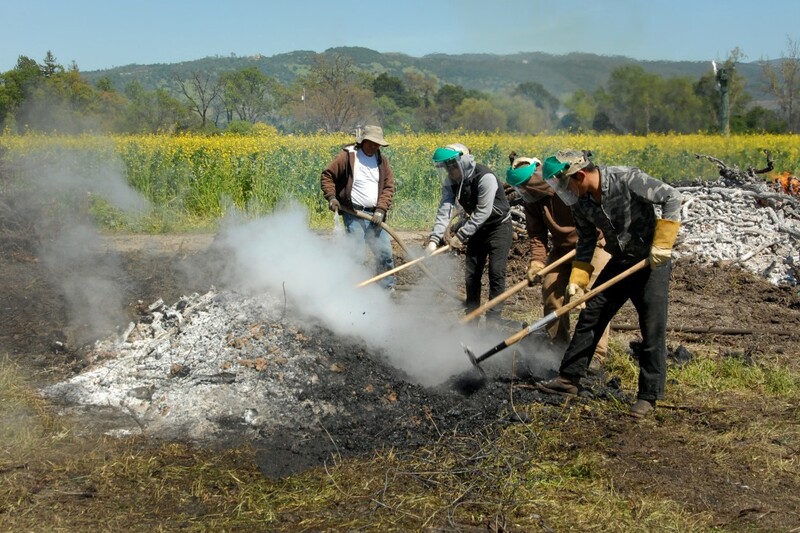 Gaining acceptance from the farming community for biochar production and use using surplus biomass will also be critical for scaling its use, and this will also be studied. 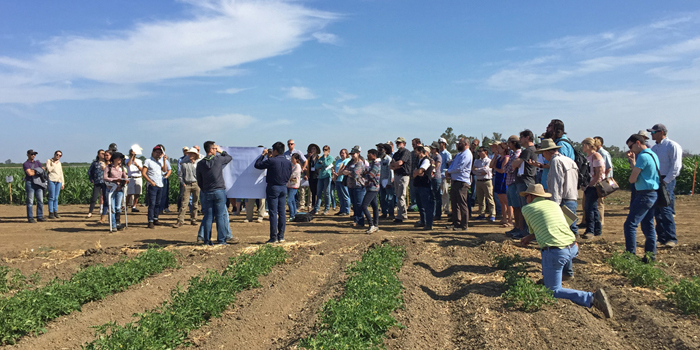 These are some of the gaps in our knowledge about biochars that should be better understood and hopefully answered once this climate-change focused research and field trials are completed. 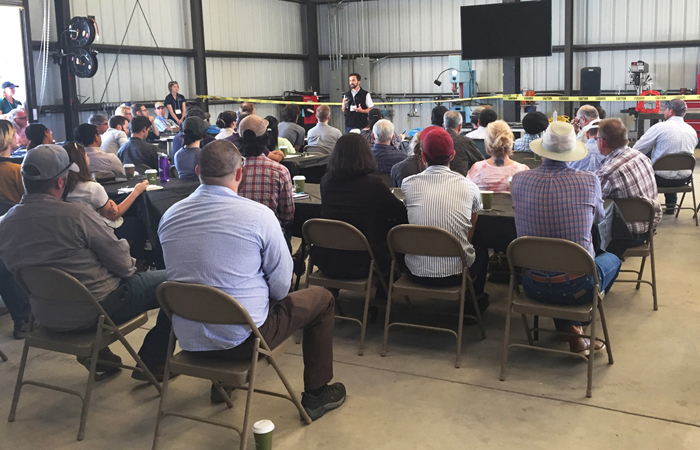 The USBI Biochar Conference, held this year in Wilmington, Delaware, was a great success, bringing together attendees from all sectors of the biochar industry along with some representatives from industries just waking up to biochar’s possibilities. While there were many technical presentations given by scientific researchers showing biochar’s amazing and diverse variety of benefits in agriculture, there was a pronounced focus this year on the use of biochar as an environmental remediation/filtration tool for stormwater runoff, wastewater treatment, and heavy metal pollution treatment. Ron Alexander, a consultant who has been instrumental in developing standards for the compost industry as it has developed over the last 40 years, lead an important discussion on what he sees as the need to standardize and refine the production, definition, testing protocols, and product claims for biochar. 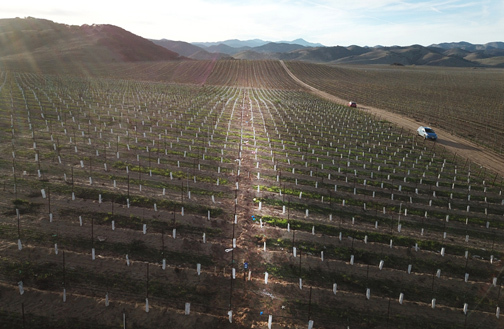 He feels that this will be critical for the industry to scale and so that consumers can understand the value proposition for its use and can be assured that a given type of biochar will produce known and replicable results. Most of the workshop attendees agreed and a good discussion took place. While no exact path forward was agreed upon, I do believe this discussion made an impact and that those in the room (and now all of you reading this) will support a push for establishing a set of sensible standards beneficial both for the industry as well as for consumers. IBI’s biochar certification standard, and its European counterpart, the European Biochar Certificate, require a minimum of 60% carbon content to be considered biochar. 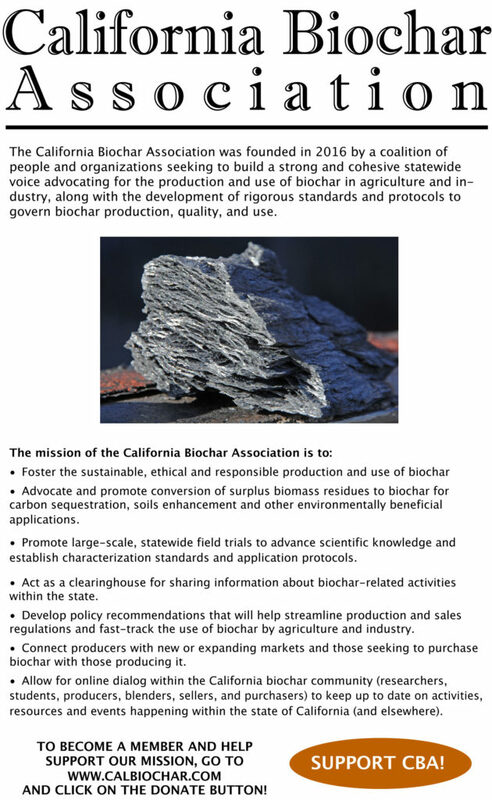 California, one of the few states to adopt a legal standard, adopted this minimum definition: “Biochar means materials derived from thermochemical conversion of biomass in an oxygen-limited environment containing at least 60 percent carbon.” In addition, the only claims that can be made on a bag of biochar in California are that it helps retain soil moisture and nutrients. While there is evidence that biochar can and does play a much bigger role in improving soil health and the plant production that comes from it, additional claims will only be allowed once a rigorous and replicable set of standards, and the scientific data backing them up, are developed. Most other states do not yet have any legal definition for biochar, however AAPFCO (the Association of American Plant Food Control Officials) is an influential organization that states look to for fertilizer and soil amendment standards, and any product definitions or claims must pass muster with them or risk being labeled “adulterated”, which can lead to products being pulled from shelves. 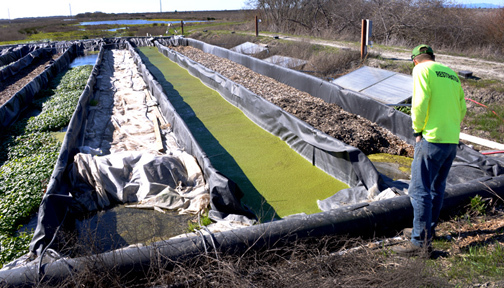 In general, the fewer claims printed on a bagged soil amendment product the better, and only claims backed up with peer-reviewed research should be included. Any claim should be backed up by at least 5 peer-reviewed studies (ideally using the same testing methods and biochar—which is not the current practice), and submitted to AAPFCO for approval. Certain words can also be problematic, such assoil health, so word choice will also be critically important when making claims to those of us selling biochar moving forward. Unfortunately, the only biochars that can fit the minimum 60% carbon definition are made from feedstocks high in lignin, such as woody residues from forestry operations and some dense crop wastes. 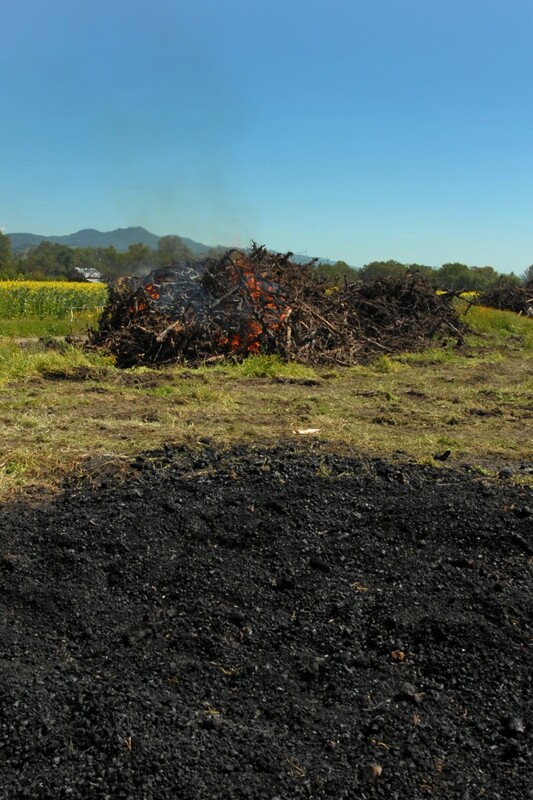 However, there is great interest and current experimentation around the world in pyrolyzing materials such as manures, poultry bedding, and other problematic waste streams to create biochars that contain much lower amounts of carbon, but that could still be considered forms of biochar valuable for certain applications. A proposed model was discussed that would sub-categorize a range of biochars as containing 10%, 30%, and 60% carbon, and though there was some disagreement the general consensus was that broadening the definition could help scale the industry more quickly than keeping the 60% number. However, I would like to propose a slightly different way to parse biochar into 5 carbon categories, then using production temperature, ash content and H:C ratio to further define general qualities potentially useful for specific applications. Regarding the sub-categories, there are indications that the ash content of the biochar and the temperature it was produced at plays a significant role in a given biochar’s effectiveness at adsorbing certain heavy metals, and that biochars made at higher temperatures are also more effective when used for this purpose. There are also indications that biochar made in the 400C to 600C temperature range may be best used for agricultural uses. The H:C ratio, used to indicate the stability of the carbon and its resistance to degradation, is also an important characteristic that needs to be supplied to consumers. Some producers think they can produce biochar from municipal solid waste, or tires, or other potentially toxic waste streams, and I strongly believe we, as an industry, need to make sure the legal definition includes ONLY the use of clean waste streams for biochar production, not the use of toxic waste streams or biomass grown on land that could be used for food production. 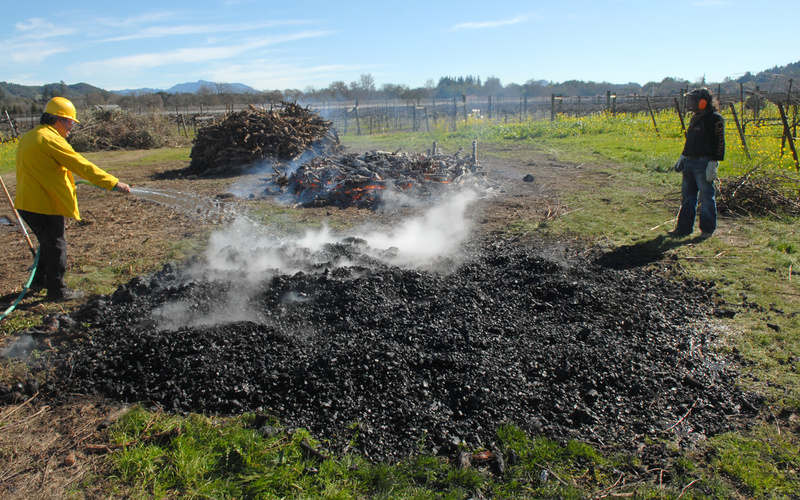 Any claims made about biochar (Increases soil moisture content, reduces nutrient loss, improves soil cation exchange capacity, increases plant production, supports beneficial microbial populations, etc.) must be accompanied by an application rate that should be used to achieve the claimed effect, otherwise such claims will not be allowed on a bagged product or in advertising. For microbial claims, a company must be able to prove which specific type of microbial species will be supported. 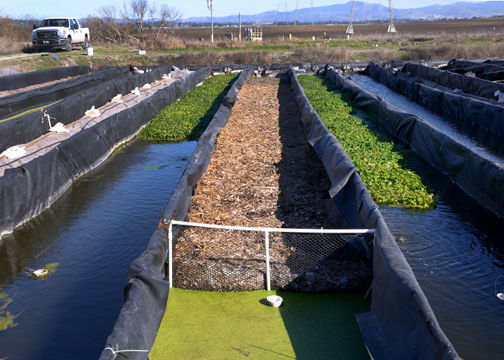 Other characteristics that could/should be identified for the consumer include feedstock type used during production, particle shape and size, nutrient release dynamics, and percentage of biochar included in any soil blends. 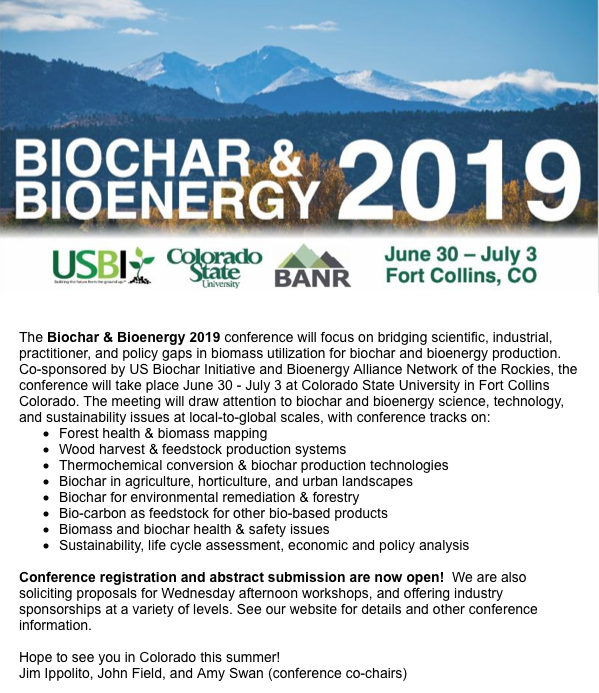 The biochar industry has matured to the point where developing and adhering to a rigorous set of standards will be critical to scaling its use. Universal biochar testing protocols must be developed so that results from different labs yield comparable results for a number of agreed upon characteristics. 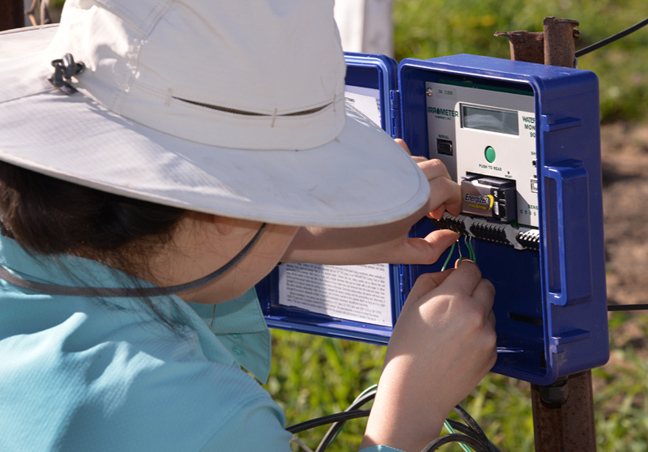 Testing costs must be reasonable and affordable for producers. 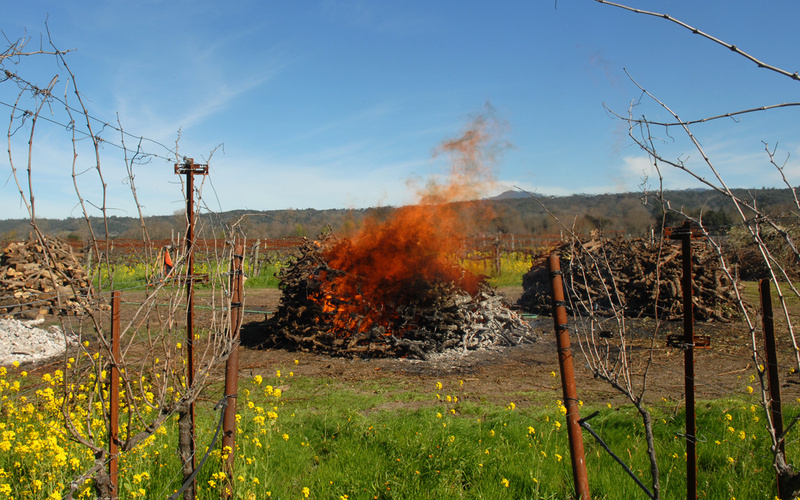 Sonoma Ecology Center and Sonoma Biochar Initiative have been retained by the Redwood Forest Foundation, Inc. to provide a research report on pyrolysis and gasification technologies currently commercially available to make biochar, from simple kilns to larger co-gen facilities. If you know of a technology that is new or coming soon into the marketplace please contact Raymond Baltar. 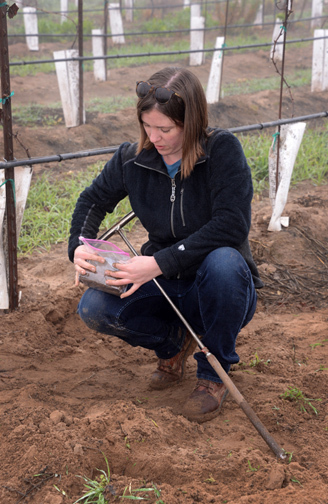 This grant was awarded to South Umpqua Rural Community Partnership (SURCP) in 2015. 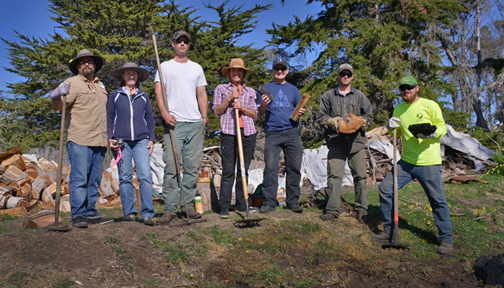 The grant was carried out by Wilson Biochar Associates and the Umpqua Biochar Education Team (a committee of SURCP) in conjunction with farmers and other volunteers. During the course of this three year project, we manufactured more than 30 kilns and made about 75 cubic yards of biochar that got used in cattle barns, goat barns, rabbit hutches, chicken coops, horse stables, alpaca barns, worm bins and outhouses. 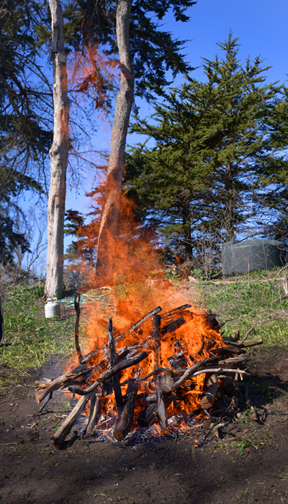 We did many pot trials and several field trials with the resulting biochar composts. 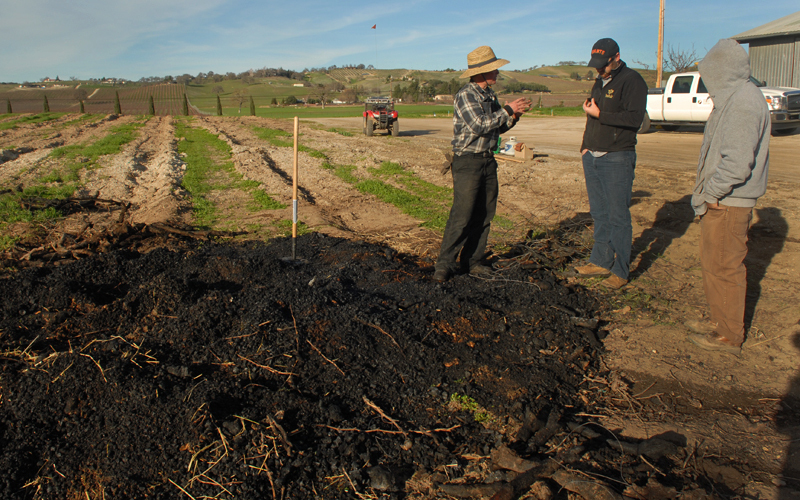 We found that most of the participating farmers could produce biochar at a labor cost of about $100/cubic yard. We produced a final technical report and a series of Practice Guidelines to help others implement their own projects. 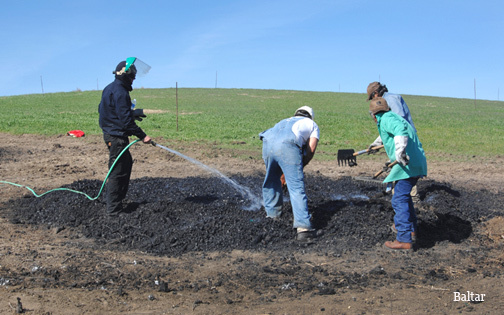 The report and the Biochar Practice Guidelines are free to share with attribution. Please distribute widely. Updates to the Biochar Practice Guidelines will be available at UBETBiochar.blogspot.com and WilsonBiochar.com. 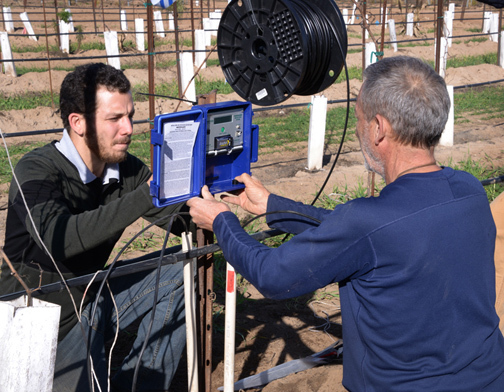 Below are some photos of UC Riverside and Monterey Pacific Vineyard Management staff installing moisture monitoring equipment at the Oasis Vineyard near King City in Monterey County. 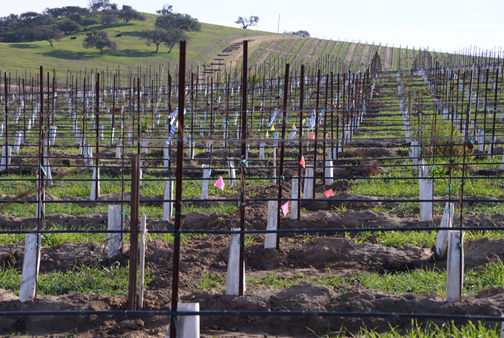 We are excited to start cataloging field trial data in this vineyard block with extremely sandy soils. 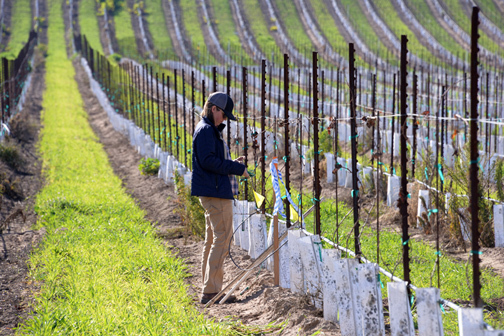 Vineyard manager Doug Beck will also be cataloguing pruning weight and fruit production differences between the control and biochar-enhanced vine rows, and UC Riverside is measuring before and after application microbial population differences as well. Photos by Doug Beck and Raymond Baltar. Below: Gathering soil samples for microbial analysis. Global Biochar Market Size Expected to Reach $585.0 Million by 2020. According to a report by Zion Market Research, the global market was valued at approximately USD 260.0 million in 2014 and is expected to reach approximately USD 585.0 million by 2020, growing at a CAGR of around 14.5% between 2015 and 2020. “Thank you again for a great seminar last week. 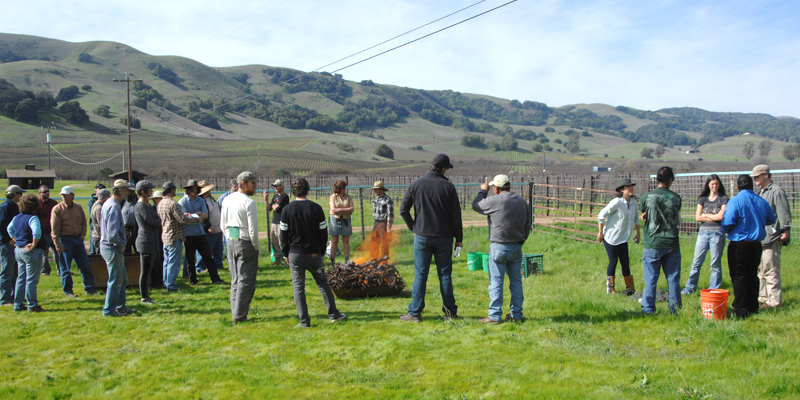 Your educational and inspirational biochar workshop has changed the way I look at burning and soil fertility. Much appreciated! Conservation burning is so much cleaner and more effective. I will never burn conventionally again if I can avoid it. 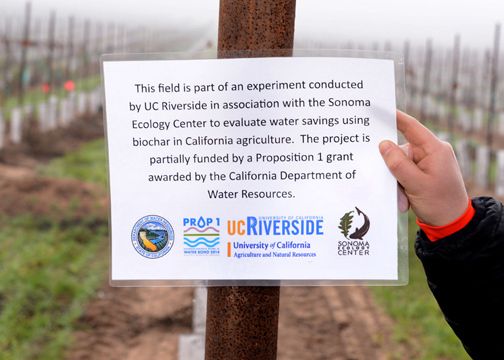 Sonoma Ecology Center, Sonoma Biochar Initiative and UC Riverside Awarded Biochar Research Grant from California’s Department of Water Resources! 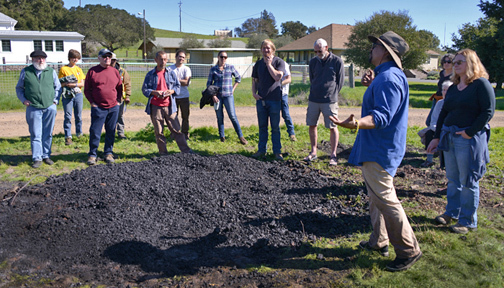 Sonoma Ecology Center and the Sonoma Biochar Initiative, in collaboration with Dr. Milt McGiffen of UC Riverside, several RCD’s, and farmers up and down the state, have been awarded a research grant to conduct major biochar field trials in California. 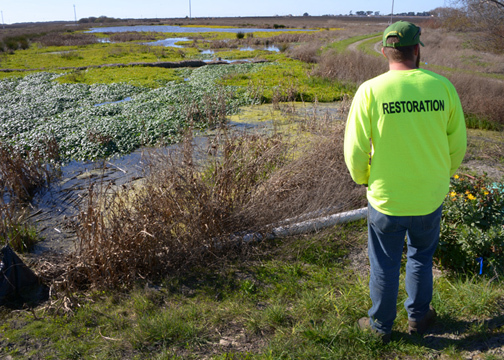 We are seeking definitive scientific data to determine whether biochar use can save farmers money through water savings. We are planning to start the field trials at 3 farms this Spring. 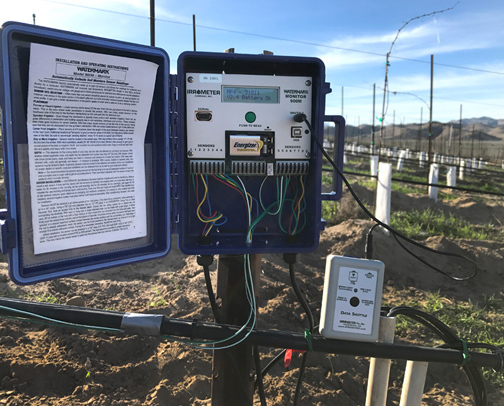 Lastly, we have applied to the Bay Area Air Qualify Management District’s (BAAQMD) educational grant program to fund emissions research that would provide hard data showing the differences between the Conservation Burn technique we have been developing vs a typical open agricultural burn. During a recent Farm Bureau presentation on open burning and other air emissions regulatory policies the BAAQMD’s representatives expressed an interest in the Cconservation Burn and we have invited them to attend our upcoming training (see below). 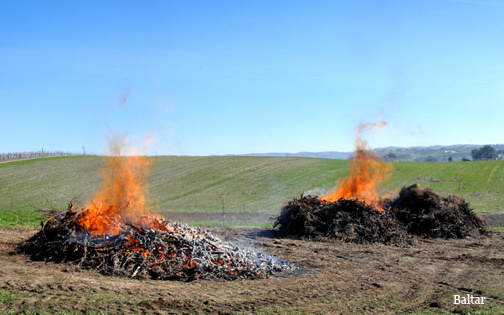 We believe that obtaining the hard data differences between the traditional and conservation burn practices would help push policy changes and broader farmer support for this simple yet dramatic way to reduce pollution while also producing biochar. In the October 21 issue of Nature Communications Woolf et al demonstrate that biochar could play an important role in removal of carbon from the atmosphere, which is increasingly recognized as essential to meeting global climate targets. Woolf compared biochar-bioenergy systems with bioenergy alone and gasification-based bioenergy with carbon capture and storage, known as BECCS. In its 2014 report, IPCC flags BECCS as the only major land-based approach expected to draw down atmospheric carbon dioxide. However, Woolf demonstrates that biochar-bioenergy systems that sequester carbon in agricultural lands could reduce carbon sequestration costs, allowing earlier adoption of a more aggressive policy of actively removing carbon from the atmosphere to avert dangerous climate change. 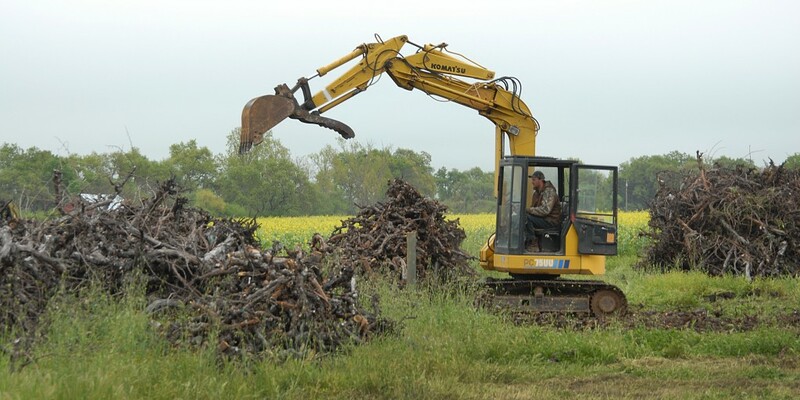 Biochar-bioenergy competes favorably with BECCS at lower carbon prices, and where biochar addition to soils delivers significant increases in crop yields. Thus, effective use of biochar as a carbon removal strategy relies on identifying those sites that are most responsive to biochar. 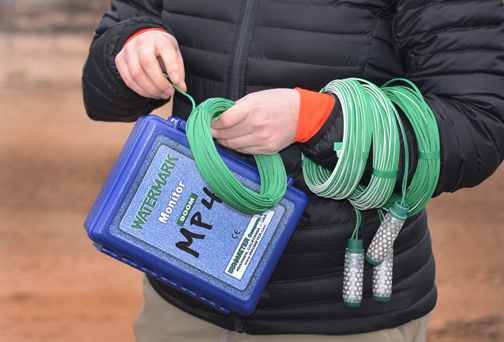 This requires similar knowledge systems as those commonly in place around the world to guide fertilizer application. Averaged across all published scientific experiments, biochar increases crop yields around 20% with application rates often exceeding 10 t/ha. However, applications of less than 5 t/ha can increase crop yields by over 50% in certain types of soils. Even highly productive agricultural lands contain patches of degraded soils that would benefit from biochar application. Precision agriculture can deliver biochar to specific field locations where it can provide the greatest soil benefits. Biomass energy in combination with carbon sequestration has enormous potential as a carbon removal strategy. However, biomass is a widely dispersed resource best suited to small-scale, distributed bioenergy systems. In contrast, sequestration of carbon dioxide is necessarily a large, centralized operation to enable separation and injection of carbon dioxide into carefully selected geological deposits. This mismatch in scale between bioenergy production and carbon dioxide sequestration is a challenge for gasification-based BECCS. 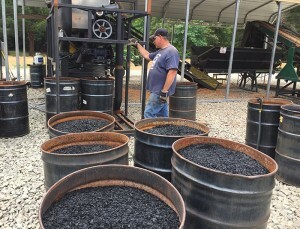 The relative simplicity of producing and sequestering biochar results in biochar-bioenergy systems that can be built at modest scale and widely distributed. Their small size reduces the risk of deploying new technology, eases financing, and speeds adoption. 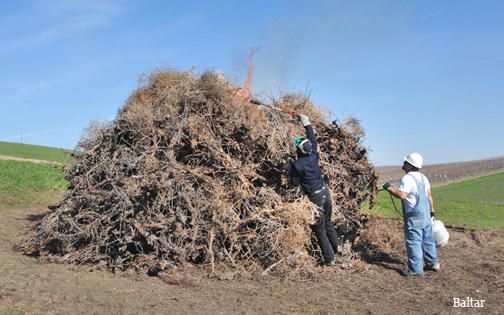 Biochar-bioenergy systems can play an important role in a global strategy to actively remove carbon from the atmosphere. 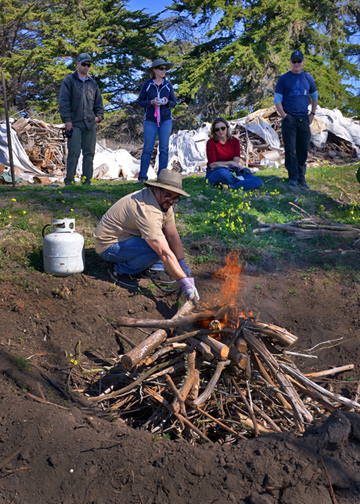 This conservation enhancement practice officially defines and supports work done by SBI over the last 4 years training farmers and foresters about the Conservation Burn technique that reduces smoke pollution while also producing biochar, as well as work done by Kelpie Wilson teaching forestry professionals how to use flame-cap kilns in Southern Oregon. 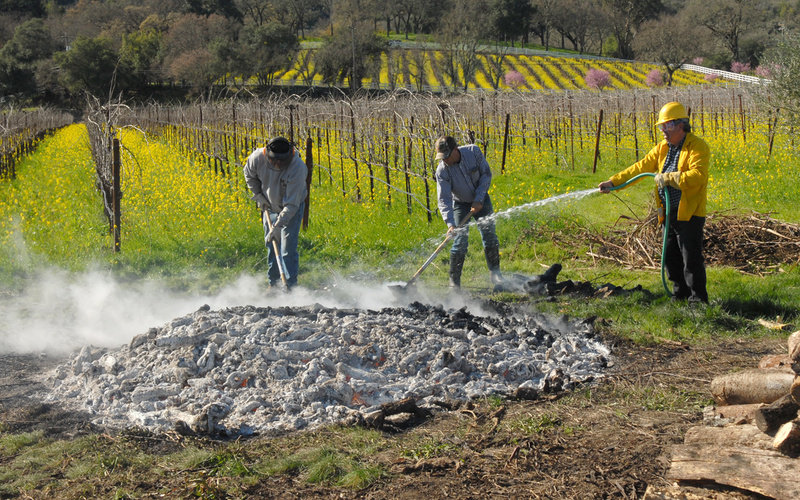 Four staff members from Sonoma Ecology Center’s Conservation Burn program trained Cakebread Vineyards staff, Wolf Vineyard management staff and workers on this top-down burn technique. 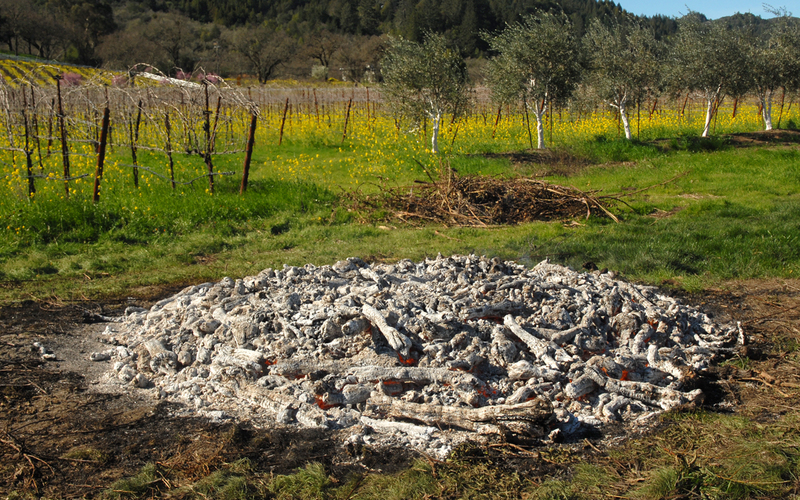 Over a two-day period 12 large piles were burned cleanly, yielding about 15 yards of biochar to be used in the winery’s garden next fall. The biochar will be crushed and added to compost for seasoning over the summer. 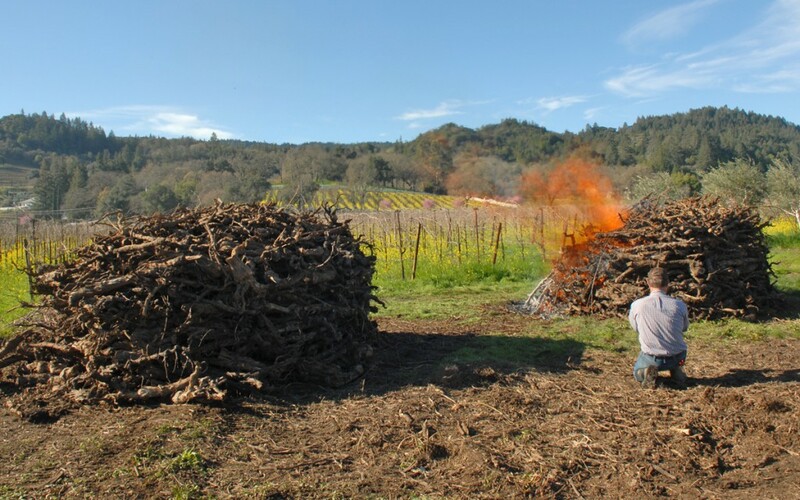 Excavator operator assembles Conservation Burn piles at a Cakebread Cellars vineyard in Rutherford. 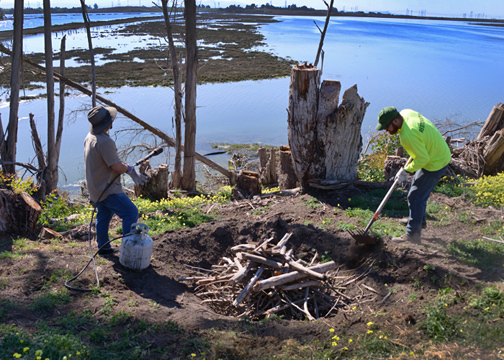 Workers rake and hoe the pile as water is used to extinguish the fire and save the carbon (biochar). 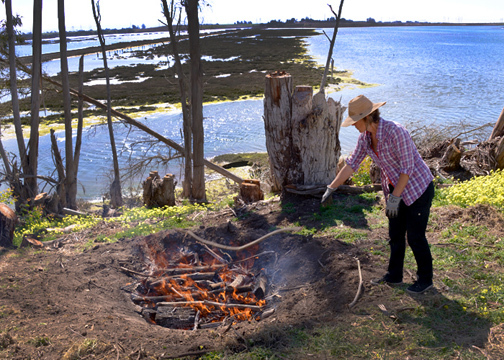 A beautiful pile of char in the foreground with a burning pile in the background. photographed recently in the Sonoma Valley. 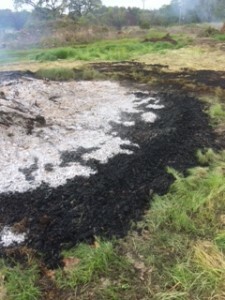 Smoky fires like this that can last for hours can be greatly diminished by utilizing the Conservation Burn technique as a BMP on your property. 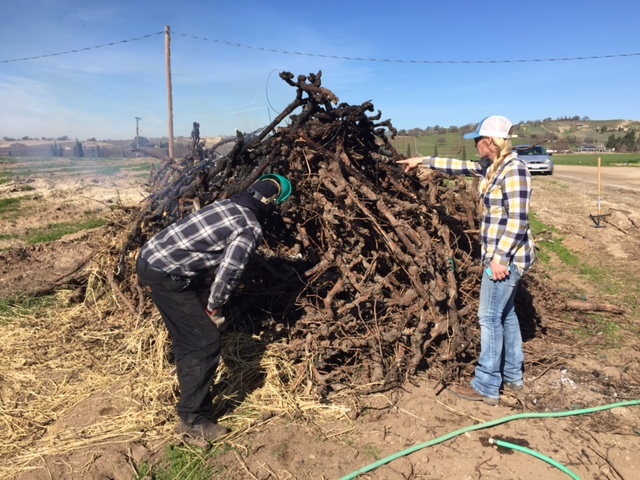 We view the Conservation Burn as a “bridge” solution that farmers can employ to reduce smoke in their community and make biochar in the process. However there are better long-term solutions as kiln and retort technologies become mainstream and cheaper. 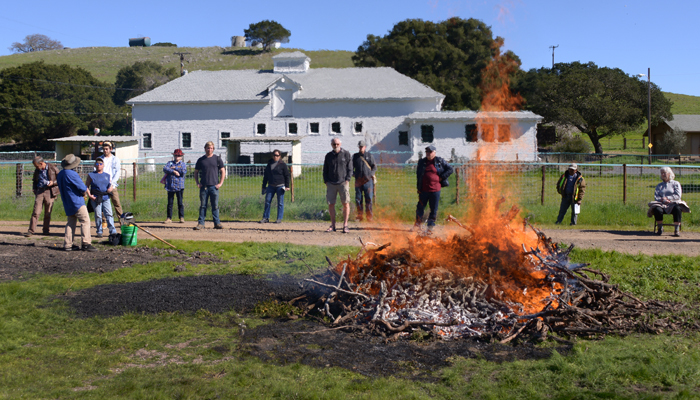 We envision a day when clean and multi-purpose biochar production facilities are located in every community, making open burning a thing of the past. 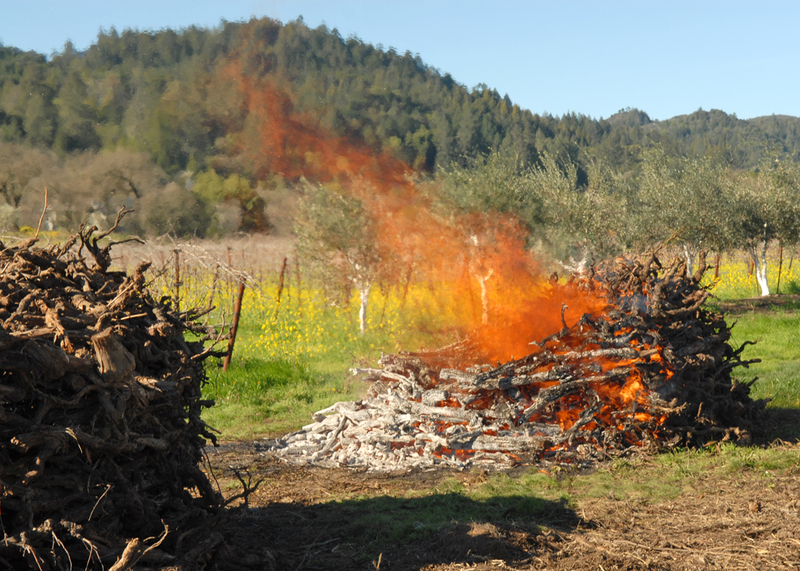 Four vine piles ready for a Conservation Burn at Pine Hawk Vineyards in San Miguel. Miles and Cuauhtemoc light the first pile at the top. The first pile takes off. 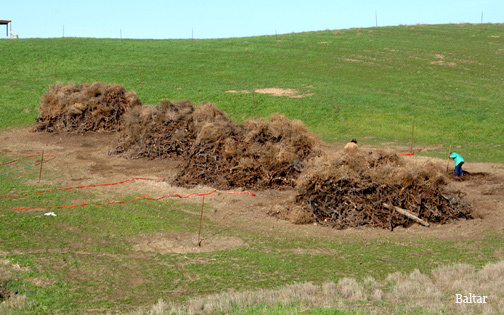 Note the pile was lit on the DOWNWIND side. 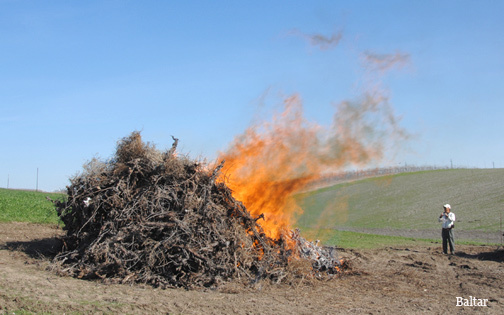 The second and third piles are lit a half hour apart, and are allowed to burn down to a critical point before extinguishing. Note how little smoke is escaping the flames. The first pile is almost ready to douse with water to save the carbon (biochar). Unburned pieces will be moved to the next pile. 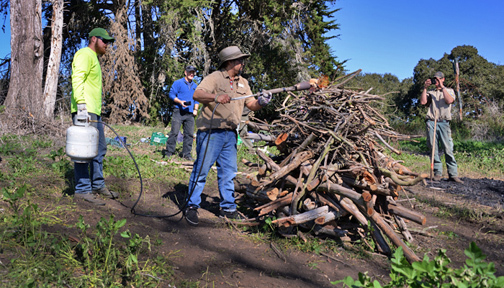 Miles, Cuauhtemoc and Pine Hawk crew members make sure the fire is completely out and rake out the partially burned pieces. 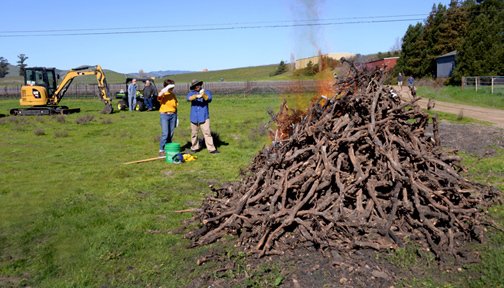 A total of 10 piles were burned that day—a record for the Sonoma Biochar Initiative—with 8 excellent crew members. Here steam is created when one of the last piles is extinguished with water as sunset approaches. 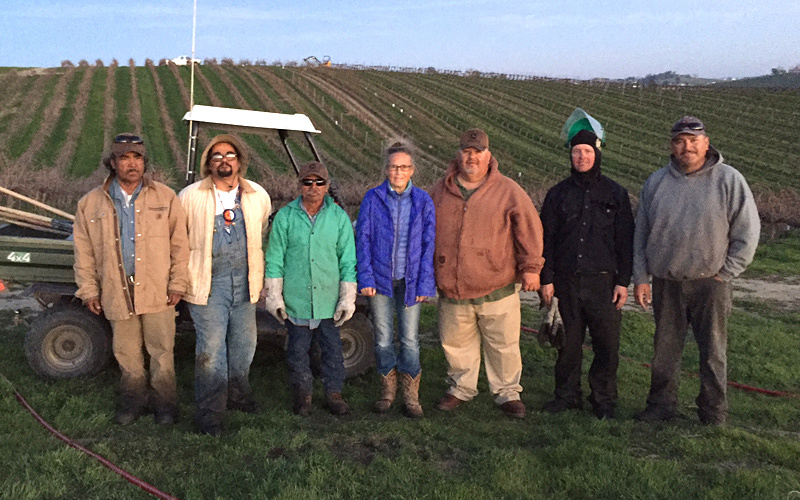 The awesome crew after a LONG day at the Pine Hawk Vineyards Conservation Burn training in Paso Robles. 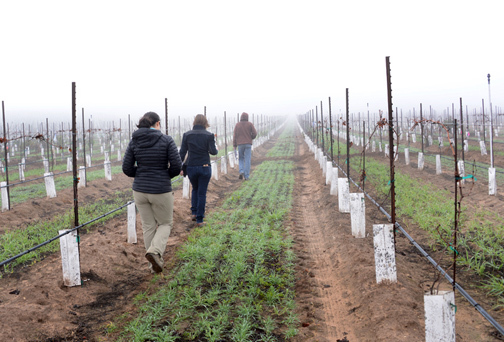 Quivira Vineyards and Winery Conservation Burn training. 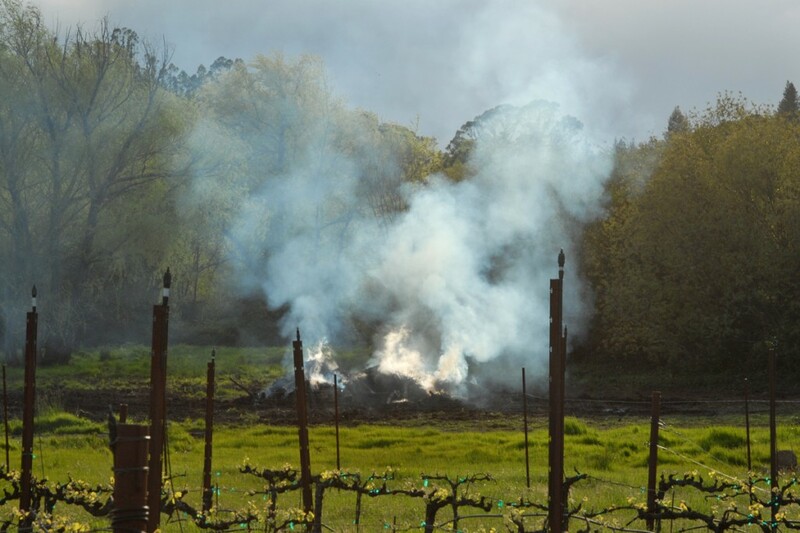 It was a gorgeous day in wine country and the Vineyard Manager, Ned Horton, and his fine crew, were impressed by the lack of smoke and how quickly the piles burned down. Quivira Vineyards / Always light the fire on the DOWNWIND side! 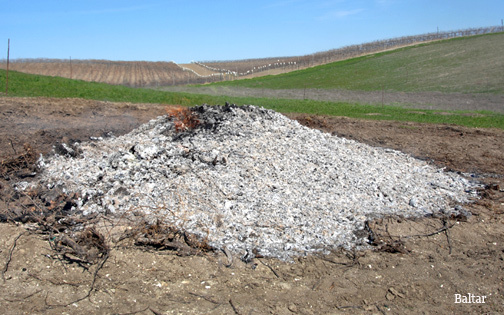 Quivira Vineyards / The pile is almost ready to extinguish to save the carbon. Quivira Vineyards / Most of the smoke gets consumed by the flame! 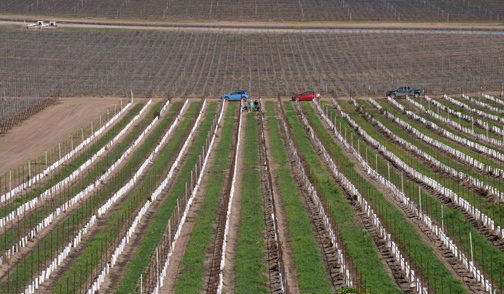 Quivira Vineyards / Look at all that beautiful biochar that was produced. 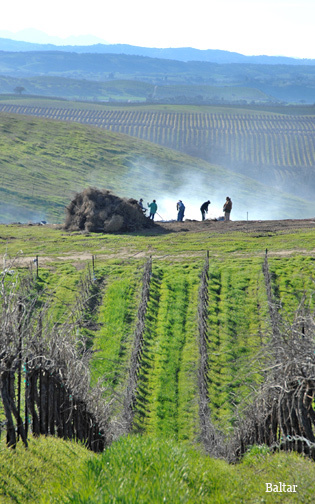 Test Conservation Burn at E & J Gallo’s San Miguel Vineyard near Paso Robles. 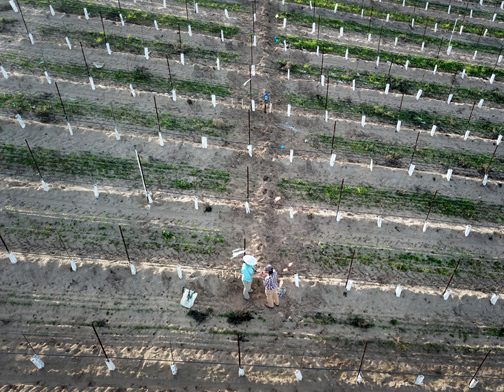 With a moisture content of 30% to 45%, we determined that these vines were too green to burn easily and that they needed more seasoning. 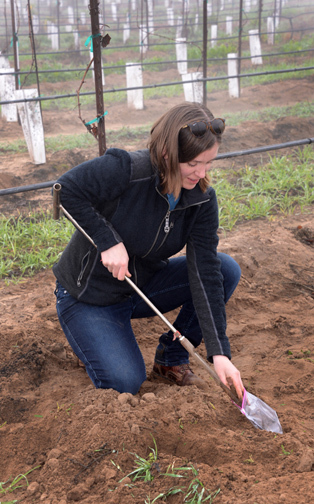 Ranch Lead Holly Smith was excited about the process and and in using biochar experimentally on some vines. 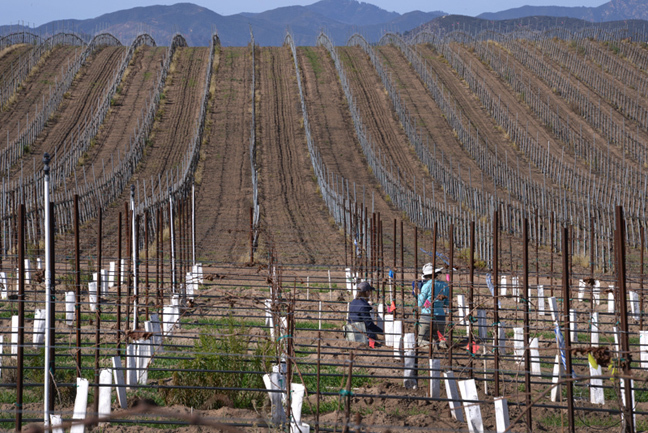 Here Miles Atchison and Holly discuss the structure of the pile and the conditions of the vines. 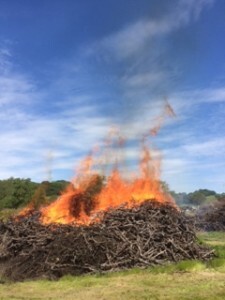 E & J Gallo’s San Miguel Vineyard / Though we did successfully burn the pile cleanly and make some good biochar, it took three times longer to burn than normal and we recommended waiting another month before processing the rest of the vines from the 75-acre vineyard. 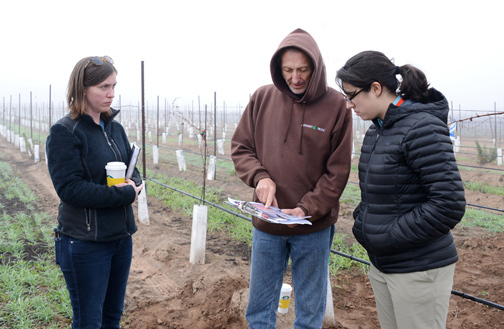 Here Miles Atchison discusses biochar with E & J Gallo staff members.